It seems like the entire right side of my body has decided to rebel against me. Ok, so not the ENTIRE side. Just a couple of key contributors: notably, my ankle and shoulder. The ankle is kinda-sorta-maybe my fault for not babying it enough the first time I sprained it badly (like, 5 years ago) and then repeating the mistake every subsequent time. It took a while. I think my time was at least 20 minutes. Meh. 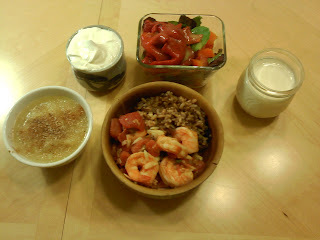 Leftover Shrimp Provencal with a little wild rice; applesauce with cinnamon, cloves and nutmeg; Fage Total; salad; milk. Nom. Stay tuned for the Shrimp Provencal recipe later! It's an old family one and is DELISH. I hate joint pain. It's seriously one of the worst. I'm glad you survived the WOD though!